Install, repair and maintain the machinery used in manufacturing and industry. You’ll become a versatile, in-demand problem solver. What is Industrial Maintenance Technology? 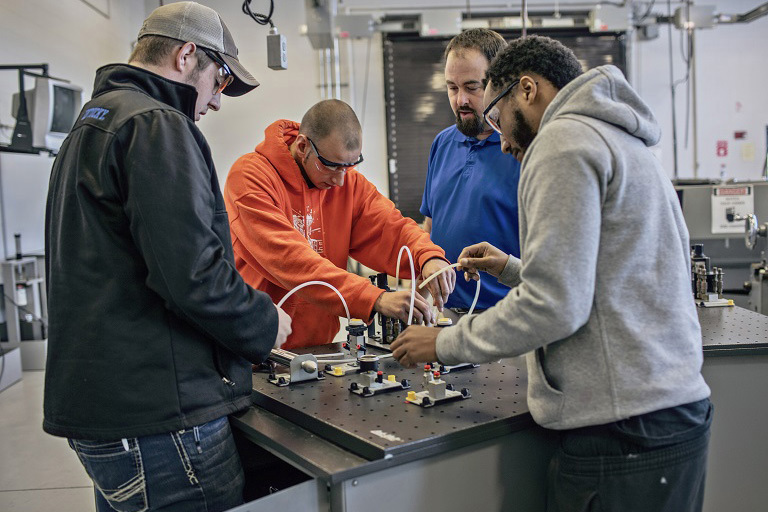 The Industrial Maintenance Technology Program trains individuals to maintain and repair industrial equipment and machines in manufacturing, construction, and buildings/industry structures. Students in this program will become proficient in the areas of machine tools, welding fabrication, electrical troubleshooting, hydraulics/pneumatics, knowledge of industrial mechanical drive systems, PLCs, as well the ability to interpret blueprints and schematics. Additionally, students develop skills in the use of testing equipment, precision measuring instruments, as well as electrical, mechanical, hydraulic and pneumatic processes applicable to industry machinery. Industrial maintenance workers are employed in the manufacturing sector in industries such as food processing and chemical, fabricated metal product, machinery, and motor vehicle and parts manufacturing. Employment also can be sought in the heavy equipment maintenance industry and building equipment such as pumps, exhaust systems, industrial appliances, and lighting changes.